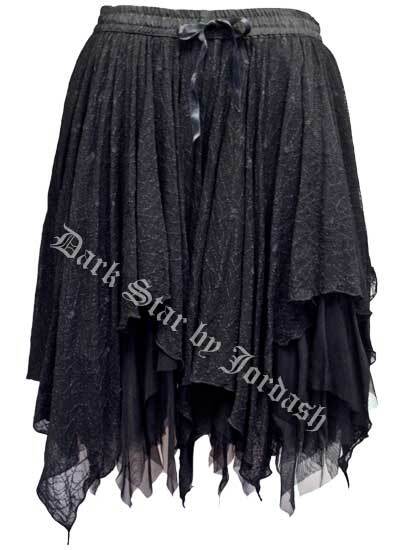 Dark Star Black Spiderweb Lace Layered Gothic Short Skirt [DS/SK/5497Black] - $51.99 : Mystic Crypt, the most unique, hard to find items at ghoulishly great prices! Dark Star Black Spiderweb Lace Layered Gothic Short Skirt Adorable for any occasion! This pretty knee length gothic skirt comprises of a top layer of black stretchy cobweb spiderweb lace over a black satin lining with a black chiffon hem showing below the lace, all cut to handkerchief points. This skirt has an elastic waistband as well as a satin cord to cinch in and out the waist. Please read measurements carefully! 100% Nylon. The Zig zag hems measure from 21-25 inches in length.